1. Can animals die of sadness? 2. Can pets die from grief? 4. How to help a grieving pet? Home > News & Resources > Can pets die of a broken heart? The 'World’s Cutest Dog' Boo has died of what his owners think was a broken heart. The news of his passing comes less than a year after his pet companion Buddy passed away. Our pet insurance can help in you pet's time of need. We offer up to £15,000 of vet fee cover to give you peace of mind when you most need it. Boo’s story does not seem to be a precedent. A little over a year ago another dog made the news when after days of wandering around an airport, appearing to be looking for someone, she died of what was believed to be a broken heart. Wandering Cloud, as the staff at Palonegro airport, Colombia named her, had spent a month roaming the terminal, sniffing passers-by, before she curled in a corner, motionless and refusing to eat. The pooch was later picked up by vets, but despite their best efforts, she died shortly after. It is believed that the dog was abandoned at the airport and when her search failed to reunite her with her owner, she died of a ‘broken heart’. But was it sadness that killed her and Boo, or was their death a coincidence that allows animal lovers to indulge in the belief that pets experience human emotions? Can animals die of sadness? Growing scientific research into the similarity between humans and animals suggests it might be possible to entertain such notions. A heart condition in humans, often caused by severe stress such as the loss of a loved one, known by the popular name of 'broken heart syndrome', causes a weakening of the heart muscle that can result in heart failure and even death. So, if a human can die of a broken heart then perhaps a pet can too? The team of a no-kill animal shelter in Washington released a heart-breaking report, saying that they’d looked in veterinary medicine for the mention of broken heart syndrome, and despite not being able to find it, have witnessed it first-hand. Cory McKeown, the author of the report, says that cats and dogs brought in to the shelter often stop eating and curl in a corner of their cages hiding their heads in their paws. However, as McKeown says, there is no mention of broken heart syndrome in veterinary literature and there is no medical evidence that indicates that pets suffer the physical symptoms of broken heart syndrome. Furthermore, for every story of a pet dying following the loss of an owner, there is one of a pet spending years stoically waiting for the return of the deceased and eventually dying of old age. We spoke to veterinary surgeon Dr Neerja Muncaster who says: "Animals certainly can exhibit significant behavioural and character changes when an animal or person that they are attached to dies. "These changes can trigger physiological changes that can lead to the deterioration of that animal's health. "Conversely, I have also witnessed positive changes in behaviour, for example, increased confidence and interaction, in animals who have been dominated or bullied by another animal in their household. This can occur in some multi-cat households. When the aggressor dies, the more timid cat will often exhibit altered behaviour." Veterinary medicine provides no proof that pets die of heart failure due to stress, but observations show that pets do go through behavioural changes and even death when they lose an owner or a companion, suggesting that perhaps there is something happening to them. Can pets die from grief? When Dr Stanley Coren PhD, canine psychologist, visited an old friend, he was surprised to find their pet companion group had gone down from two Boston terriers and a cat to only one Boston terrier. He told Psychology Today, that his friend explained that her dog Lily had died and shortly after her cat Rosie followed, leaving one surviving pet. 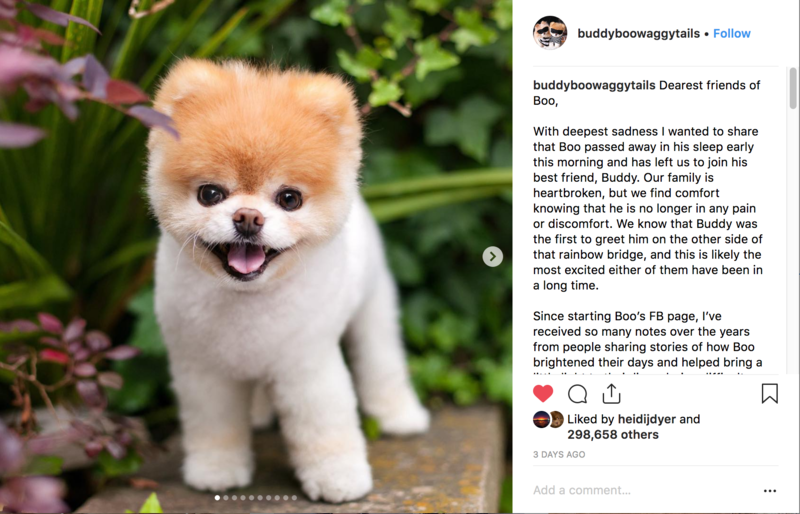 Much like social media star late Boo after his pet companion Buddy passed away. In a 2011 article for the Daily Mail, reporting on the death of a dog in Afghanistan that had lost its owner, animal psychologist Roger Mugford said that he’s witnessed "a number of cases in which pets have died of grief". These stories bring to mind a phenomenon among people known as the widowhood effect where one partner of a couple dies and the other becomes severely depressed and follows within the next three months. And even though the widowhood effect has not been documented in veterinary medicine, according to a study conducted by the journal Animals, there is plenty of evidence that pets experience grief in a similar way to humans. The study, a survey of 279 people, showed both cats and dogs can experience severe behavioural changes following the passing of a fellow animal. The animals often kept searching for the deceased and whined and whimpered when they couldn’t find them. In addition, the cats and dogs in the study, a lot like Wandering Cloud and the animals in Cory McKeown’s animal shelter (and just like humans when they are depressed), exhibited moderate to severe loss of appetite, lack of energy and loss of vivaciousness. Unfortunately, when cats stop eating, they are quick to develop a condition called fatty liver disease, which causes liver failure and eventually death. Cats normally develop the disease as the result of stress-related appetite loss; so, when cats grieve, it is not their heart that takes the hit but their liver. Something similar happens to dogs when they stop eating. A number of biochemical reactions kick in and in order to make up for the lack of energy, the body begins digesting internal fats and the metabolism becomes sluggish. Lethally low level of blood sugar levels set in. So, it could be argued that, in cases of severe loss of appetite, pets' grief leads to a form of indirect self-destruction by refusal to feed. The warning signs of grief in animals are many, so learning to recognise them could help owners take action before the symptoms of grief have taken an irreversible toll. Some dogs will start crying and whimpering as soon as they sense their owner is about to set off to work – this is separation anxiety and can be extremely severe for some pets, especially after bereavement. Pets who are extremely attached to their owners (or fellow companion pets) tend to be hit the worst by separation anxiety and grief. The bigger the attachment bond, the more severe their mourning. How to help a grieving pet? Vet Dr Karen Becker recommends keeping the pet's routine as stable as possible, including feeding, walks and other daily interactions and encouraging and providing plenty of distractions to take the pet’s mind off the loss, such as long walks, exercising together and playing fetch. In addition, she advises giving your pet enough time to cope with the loss before you introduce a new pet into the family. Pets have a natural ability to pick up on the moods of their owners, so avoiding emotional outbursts around your pet might also speed up his or her recovery. We've written an article on how to help a dog with depression here. In addition, nearly all of our pet insurance policies cover treatment for behavioural disorders. You can get a quote here. Evolutionary biologists believe that grief has the purpose of motivating emotional bonding and attachment. And where there is attachment, there is separation anxiety. Domesticated animals are very social and easily become deeply attached to their owners and companion pets and can suffer when they lose them.